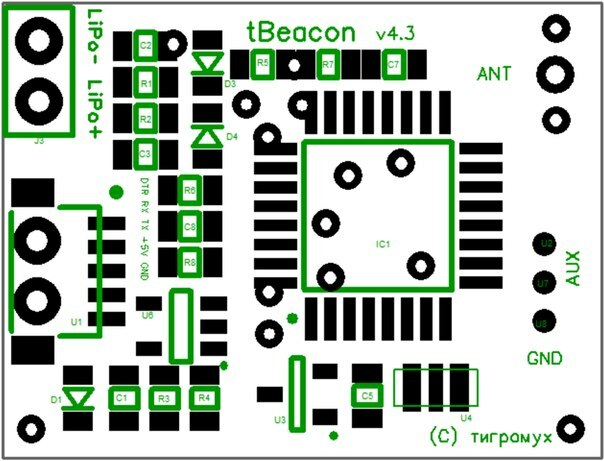 It is permitted to make a tBeacon for your own personal use. Do not produce device(s) for sale without explicit permission. If you find the beacon useful, please to support future development. Please note, that there is only UART connector on the PCB, therefore you'll have to flash a bootloader to the uC either via socket tool or on prototyping board. The RFM22B is soldered with quartz oriented towards the switch. R1, R2, R4: SMD 0805 100 Оhm. On the reverse side there is only RFM22B, soldered with quartz to the connector side of the PCB.